The Muslim Judicial Council (SA) offered its sincere condolences to the Alexander family on the loss of their beloved son, Abdul Muttalib who was killed in a drive-by shooting in Mitchell’s Plain. Abdul Muttalib (19), was caught in cross-fire during a drive-by shooting on Saturday evening. According to his family, he and a few friends had gone to buy a Gatsby when they were shot. Alexander was wounded several times and was declared brain dead on Sunday whilst his friend Tauheer Samuels was shot in the hand. Speaking on behalf of the MJC, 1st Deputy president Moulana Abdul Khaliq Allie expressed his dismay that society has lost a beacon of light within the community. We pray that Almighty Allah replaces the hurt and pain of the parents with contentment and the patience to deal with their loss, Ameen. Caption – Main photo: Abdul Muttalib (left), was caught in cross-fire during a drive-by shooting on Saturday evening. 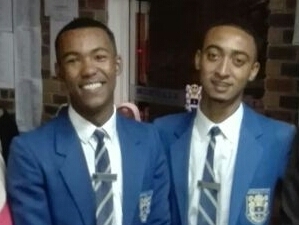 His friend, Tauheer Samuels (Right) was wounded in his hand.